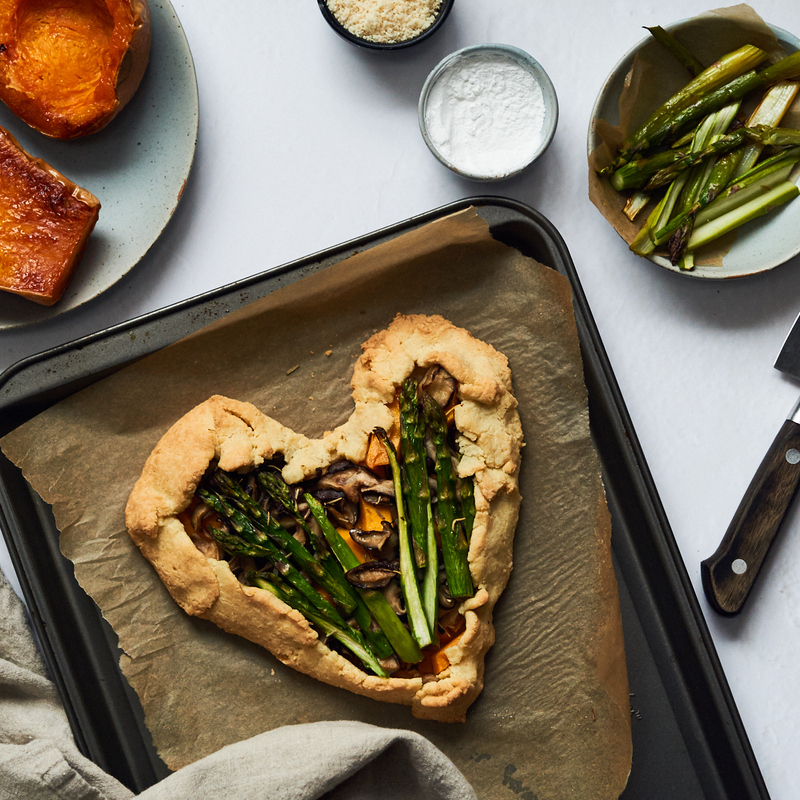 This year, instead of making something sugary, we decided to make a savory galette for Valentine’s Day. Galettes are one of those types of recipes that every time we make one we feel like we made something really special and unique (all the while, it’s really easy to put one together). This recipe turns out perfectly with grain free almond flour and tapioca flour, with the perfect balance in texture, a little bit soft and then slightly crisp on the edges. Asparagus are a good source of folate, a B-vitamin, that the body converts into folic acid once consumed. Folate is an important nutrient for brain health and a deficiency has even been linked with depression and dementia. Asparagus contain many flavonoids, including quercetin, and phytonutrients that have been studied for their role in supporting the immune system. You can always make this recipe in a circular shape for a more classic galette. No need to form the crust into a heart, unless you want something special! 2. Place the almond flour, tapioca flour and sea salt in the food processor and pulse a few times. Cut the butter into smaller pieces and add to the food processor. Pulse several times until the mixture turns into a fine crumble. Add in the egg and pulse a few more times to combine. This should form into a sticky dough. Use your hands to form into a ball. 3. Place the dough in the fridge for about 10-15 minutes. 4. Meanwhile, prep the vegetables. Remove the mushroom stems and slice thinly. Trim off the tough ends of the asparagus. Carefully slice the asparagus lengthwise, so they are thin (if you’re using very thin asparagus to begin with, you can skip this step). 5. Cut the butternut squash into thin pieces. Rub with a little bit of extra virgin olive oil. 6. Heat some oil in a skillet and add the garlic, mushrooms and rosemary. Saute for a few minutes until the mushrooms are lightly cooked. 7. Take the dough out of the fridge and place between two pieces of parchment paper. Use a rolling pin (or a circular bottle, such as a wine bottle) to roll out the dough. It should be about 1/16th of an inch thick. Lift the bottom piece of parchment paper carefully with the dough on it and place on a baking sheet. 8. If you’re making a heart shaped galette, here’s where you’ll make a heart shape (just use your fingers to move the dough into the shape). 9. Place the squash in a layer on top of the dough. Leave about an inch of dough along all edges of the heart. 10. Then add the cooked mushrooms on top. 11. Place the asparagus over top. 12. Then carefully fold the edges of the dough over toward the center, using your fingers to press it in. 13. Place the baking sheet in the oven and bake for 25 minutes. Check the galette to make sure the dough is cooked but not burnt. 14. Let cool for 5-10 minutes before slicing pieces and serving.